One of James Thurber’s illustrations for “The Greatest Man in the World” when the story was reprinted in his collection The Middle-Aged Man on the Flying Trapeze (1935). © 1935 James Thurber. Image reproduced by arrangement with Rosemary A. Thurber c/o The Barbara Hogenson Agency. “The Greatest Man in the World” is characteristic of Thurber’s satires and parodies: “genteelly vitriolic,” as The New York Times put it. At the time he wrote the story, Scribner’s magazine had been running a series of short “alternative history” pieces imagining what might have happened if events had turned out differently (e.g., “If Napoleon Had Escaped to America”). 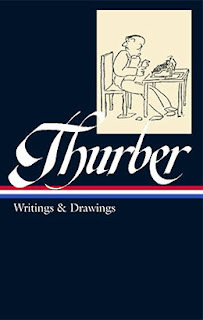 “To Thurber,” write Kenney, “the series begged to be parodied,” and his first New Yorker piece in this vein was “If Grant Had Been Drinking at Appomattox.” Then, inspired by the public adoration for aviator Charles A. Lindbergh after making the first non-stop transatlantic flight in 1927, Thurber wondered what if, instead of a man as modest and gracious as Lindbergh, America’s next hero turned out to be an illiterate, ill-mannered, drunken boor. Thus was born Jack “Pal” Smurch. Of course, Thurber wasn’t ridiculing Lindbergh himself; he was instead mocking the American susceptibility to hero worship—and the part played by the media in fostering such narratives. Perhaps not surprisingly, the figure of Smurch has often been invoked over the last eight decades—up through the present election cycle—when referring to certain politicians and celebrities. If anything has changed since Thurber’s day, it’s the more prominent role of the media in tearing down such figures after building them up. Looking back on it now, from the vantage point of 1940, one can only marvel that it hadn’t happened long before it did. The United States of America had been, ever since Kitty Hawk, blindly constructing the elaborate petard by which, sooner or later, it must be hoist. . . . If you don't see the full selection below, click here (PDF) or click here (Google Docs) to read it—free! Ernie's comment probably requires a clarification: Although the "genteel" reference above is to Thurber's writing, it was Lindbergh (not Thurber) who had children outside his marriage.